The original product the world trusts! Equistar creates a silky coat and impacts a glossy shine to coat, mane and tail. This effect lasts for up to 12 days. Mane and tail remain tangle-free and the coat keeps glossy for that time – guaranteed. During that time Equistar repels dirt and dust. Your horse is perfectly groomed and cared for – with a fascinating shine and a coat like velvet. Trust the original! If you use Equistar only for mane and tail, the results are awesome – Equistar’s effect has not been known so far from other products. Equistar detangles mane and tail without any effort. Preliminary washing and time-consuming disentangling of the tail are unnecessary. Detangling takes place automatically after drying. With Equistar there will be almost no loss of tail hair because of brushing and disentangling the tail. Grass stains on greys are a matter of the past. Even persistent sweat crusts are removed with a few strokes of the brush. Daily grooming time is considerably reduced. However, the horse gets a wonderful sheen. In summer the yellow eggs of the warble fly cannot stick to the coat any longer thanks to Equistar. If Equistar is applied before clipping, the blades are spared and the clipper head will not overheat quickly. The coat must be absolutely dry before clipping! Equistar is non-toxic, pH-balanced and extremely gentle to skin. Skin breathing is not reduced. Skin and hair are mildly cared for. The natural skin and hair health is supported. 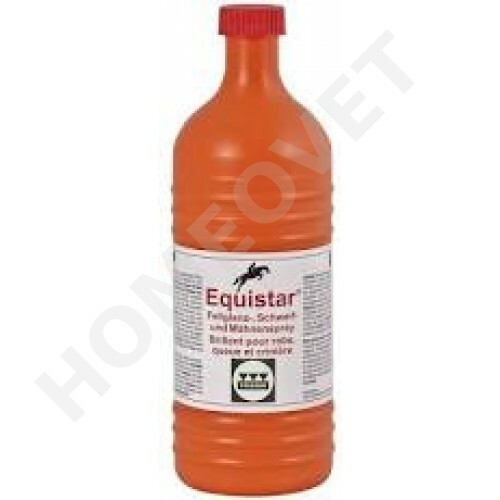 That’s why Equistar can also be used on very sensitive or outside horses and ponies. Equistar can be easily washed off with shampoo. It does not grease. In view of man, animal and environment Equistar contains almost only natural ingredients that are under constant quality control. We don’t add any unnecessary emulsifiers. Therefore, please do not forget to shake well before use. Preliminary washing of the horse is not necessary. Spray Equistar sparingly on the dry or wet coat or long hair. Let it dry completely and then brush over with a soft brush. Please always wait until the hair is really completely dry. If not, Equistar cannot develop its full effect!